Hood Cleaning Tips There is no denying the fact that a well-functioning range hood is one of the most important parts of a kitchen. 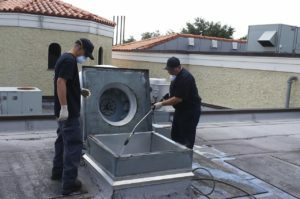 While vent hoods or range hoods are available in a wide variety of styles, sizes, designs and features but when it comes to cleaning and maintenance, the process is pretty similar for most of the models. Needless to say, you want to make sure that your vent hood is running as it should in order to keep the smoke and grease away from your kitchen. Here are a few hood cleaning tips to help you achieve a smoke and grease free kitchen. Even if you regularly clean the hood, there are chances that something may go wrong and your hood stops working as it should. It is also better for you to keep in mind that the hood components will wear down with time due to constant use or buildup of grease. Here are a few situations where you need to call an expert for making repairs or for maintenance. If you find that your kitchen is full of smoke even when the hood is running on high setting, it means that the duct is obstructed due to debris or due to buildup of grease. It may also be due to malfunctioning fan or a problem with the motor. In other words, the hood needs to be cleaned and you need to call in an expert for cleaning or for repairs. In case the motor is making excessive noise, it requires cleaning or repairs. In some cases, the motor also needs to be replaced. Again, you need to call in an expert to do the required work. In case the buttons or the lights of the hood are not functioning, it may be due to a problems in the control board. Give a call to an expert and they will fix it in no time. Air filter in the vent hood is responsible for getting rid of the smoke and particulates before the air is pushed outside or is recirculated. There is a charcoal filter or a metal filter inside the hood and both these types should be cleaned on a regular basis. For cleaning the metal filter, you should remove it and place it in a container that is filled with degreasing solution. This solution will dissolve the built-up grease on the filter and once that’s done, you should just run it through warm soapy water for proper cleaning. Don’t forget to make sure that it’s completely dry before you reattach it. In case your hood has a charcoal filter, it can’t be cleaned and you will have to replace it. Experts recommend replacing the charcoal filter on an annual basis. When it comes to cleaning the hood, the process is rather simple. Take your regular household cleaning spray and just clean the hood like you would any other surface in the house. Make sure that the cleaning spray is nonabrasive. 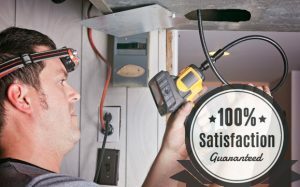 The vent should be checked on a regular basis as grease builds up with time. It not only affects the efficiency but also becomes a potential fire hazard. In case you notice buildup of grease inside the vent, you should give a call to a professional as quickly as possible in order to give it a thorough cleaning. It is recommended to clean the fan on a regular basis in order to avoid huge buildup of grease and dirt. If there is a huge buildup of grease and dirt on the fan blades, it will put more stress on the motor which may even lead to eventual failure of the motor. Overall, these are some of the most important hood cleaning tips that should keep your hood working efficiently. One of the most important things you should do is to check up your hood on a regular basis. It will allow you to notice any buildup of grease or dirt inside the vent or another part of the hood before it becomes a big problem. It is important that you give a call to a professional as and when you notice buildup of grease or dirt inside the hood.